Not being a professional firewood producer, I just blunder along on my own, learning by my mistakes, and there have been plenty of them. I've stacked wood piles that have fallen over just after they were completed. And I've had the ends of stacks collapse because they had been built with bad technique and wishful thinking. I'm getting better at it, though, and have enough confidence now to share some ideas and invite others to contribute theirs. Firewood should be kept up off the ground for seasoning to promote drying and prevent mould growth. Because I cut and split my wood in the bush and stack it in an opening there, then move it to the house in fall, I have to use materials that are handy. So I use poles cut in the bush as rails on which to build my stacks. There are many smallish spruce trees where I cut my firewood and inevitably some have to be removed. I find a reasonably level spot and lay down two six inch diameter spruce poles that are about the same length. I say reasonably level because there is no perfectly flat ground in the rough and rocky area where I live. But I've found that reasonably level is good enough, especially when other techniques are used to compensate. I place the poles about 12 inches apart because I cut my firewood short, only 14 inches. 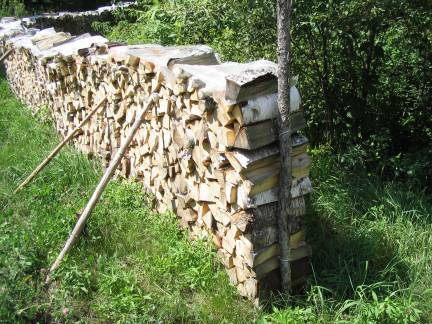 Freestanding firewood stacks need to have straight sides if they are to stay upright for the minimum of four months and maximum of two years needed for seasoning. The shorter the individual pieces, the narrower is the stack and the more wobbly it is likely to be. I like my wood short because it is easier to handle and split and it can be loaded into my stove in either direction and I like that flexibility. But short pieces make for unstable piles, which is why I need to take care to pile it fairly well. Stacks are usually built from one side and I find that my piles begin to lean towards me as they rise. So I now check the end of the pile and other side frequently as the pile gets higher to make sure it is not leaning. If it is, I adjust it by tapping the ends of pieces to push the pile vertical. The trick is not to leave straightening until the stack is more than waist high because it gets harder to straighten the higher it gets. Also, most pieces of firewood are slightly bigger at one end than the other because of the grain direction, knots and other imperfections (especially in the junk wood I tend to burn). So, to keep the top of the pile level, I put the larger end of each piece on the low side of the stack. That way, the top of the pile is always nearly level. Narrow stacks built of short pieces are inherently unstable. Sticks wedged against the sides solves the problem. Note also that this stack has a crisscrossed end treatment.Despite using good technique and taking care, narrow freestanding stacks are still not very stable. So now I swallow my pride and wedge sticks against the piles to give them some stability and resistance to rocking in side winds. The sticks also compensate for movement over time caused by the settling of the rails into uneven ground. Also, I've found that four feet seems to be the best height for a stack. Any higher and stability becomes a problem. Plus, by pacing off the length of the stacks a rough cord count can be made. 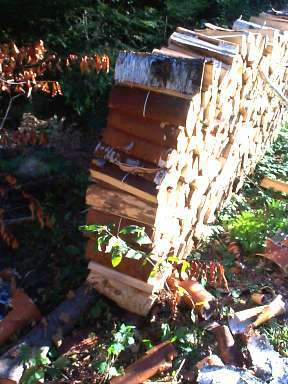 The mark of a good firewood piler is the way he or she treats the ends of the stacks. A common method is to crisscross the pieces in alternate layers to form a pillar at the end that is (theoretically) stable in both directions (photo above right). To make this technique work, though, you have to be careful in selecting the pieces used and placing them deliberately. 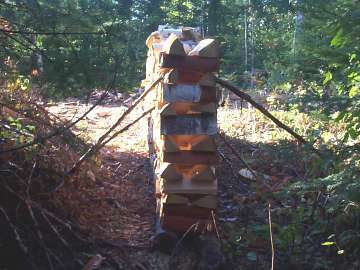 There is little point hurrying or being sloppy in using the crisscross technique because the end of the pile will fall out and much work will have been wasted. I know this from personal experience. The pieces used for the crisscross structure need to be straight grained with even sides and little or no taper. In the firewood I process, there aren't many of those, so I always have to pick through the rough pile to find them. One criticism of the crisscross end treatment is that the ends are less densely packed than the core of the stack. 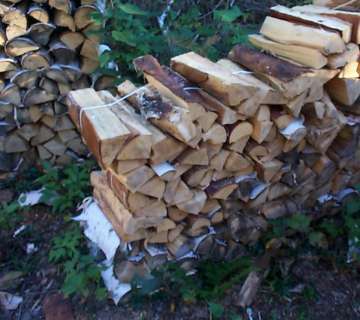 If a firewood supplier piles the wood four feet high and eight feet long to form face cords or stove cords and uses the crisscross end treatment, the purchaser could complain of being shorted because of all the air space on the ends. Obviously this is of little consequence if you process your own wood. Another option for end treatment is to use twine to tie every third or so piece on the end back into the pile. While this may seem fussy, it really doesn't take any more time than finding and placing crisscrossed pieces and it does produce a stack that is evenly dense. Here is a pile with a post driven into the ground and tied into the stack. This is a quick and reliable method.But I think the quickest and most effective end treatment is to drive a stake into the ground and tie it back into the pile with twine (recycled hay binder twine is an excellent choice). I cut twine into six foot lengths and tie a loop in one end to make a slip knot. I put the loop around the stake and lay the rest of the twine on the pile with the other end looped around a piece. Once two or three firewood pieces are piled on the twine, the stake is held tightly to the pile for a perfect vertical end. Maybe there is no 'correct' way to stack firewood for seasoning, and I suppose there might be those who say all this attention to something so apparently simple suggests a lack of anything better to do. But I enjoy visiting my stacks in mid-summer to see how the drying is coming, and finding them still standing is always a pleasure.